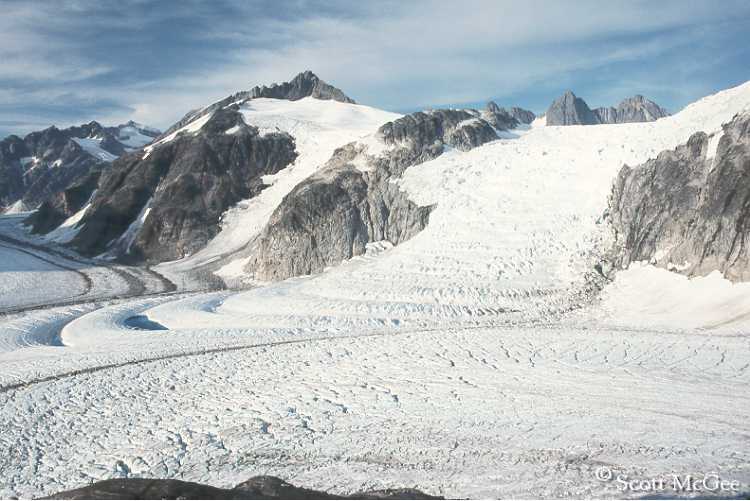 The Gilkey Glacier is a 32 km long outlet glacier flowing west from the Juneau Icefield. 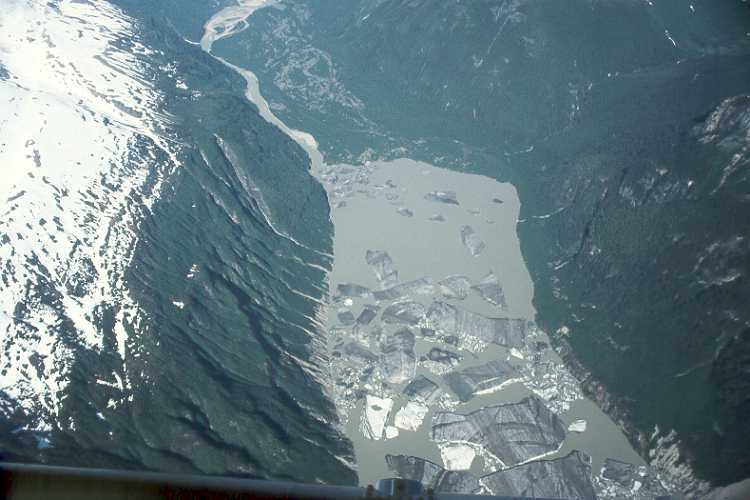 From 1948 to 1967 the Gilkey Glacier retreated 600 m and in 1961 a proglacial began to form. 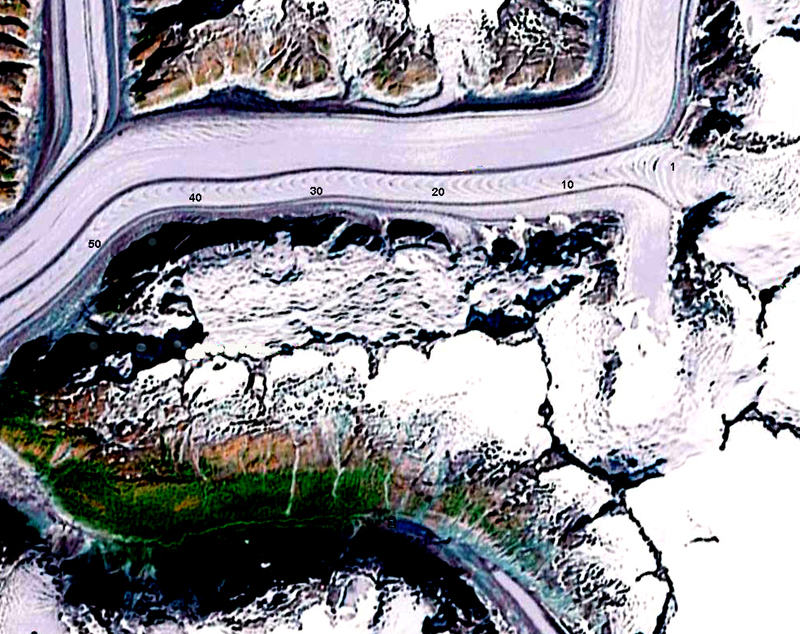 By 2005 Gilkey Glacier has retreated 3900 m from the 1948 terminus location. The glacier is currently terminating in this still growing lake, notice the new bergs and rifting at the glacier terminus. The retreat has been resulted from and in a thinning of in the lower reach of the glacier and the separation from Battle and Thiel Glacier. 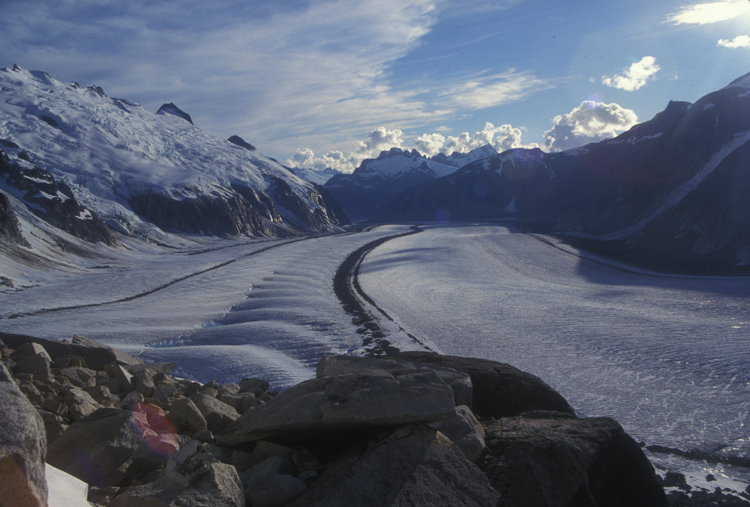 A major tributary to Gilkey Glacier, is Vaughan Lewis Glacier. At the base of the Vaughan Lewis Icefall where the Vaughan Lewis Glacier joins the larger Gilkey Glacier ogives form, as seen from above and below the icefall (Scott McGee). 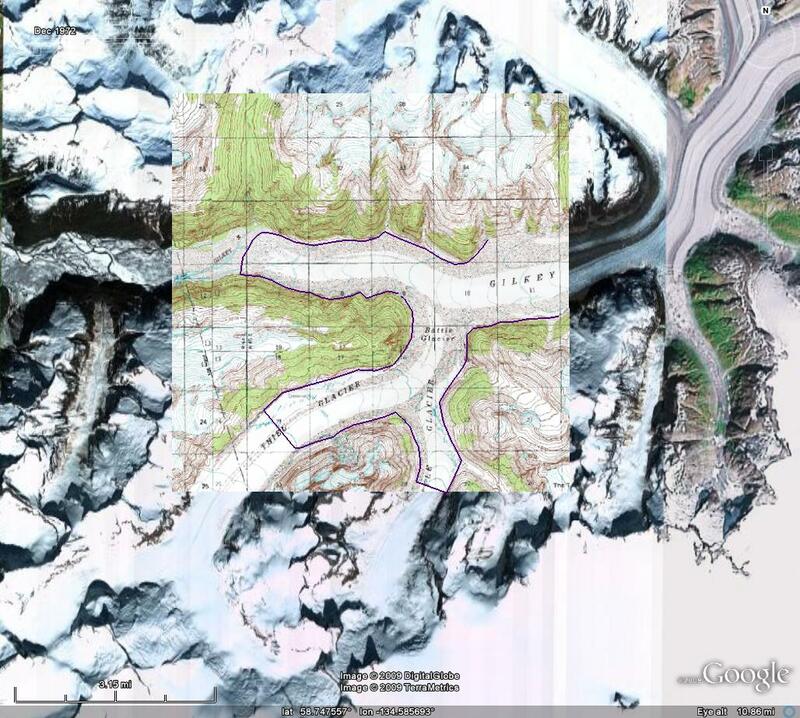 The ogives form annually and provide a means to assess annual velocity in this section of the glacier. 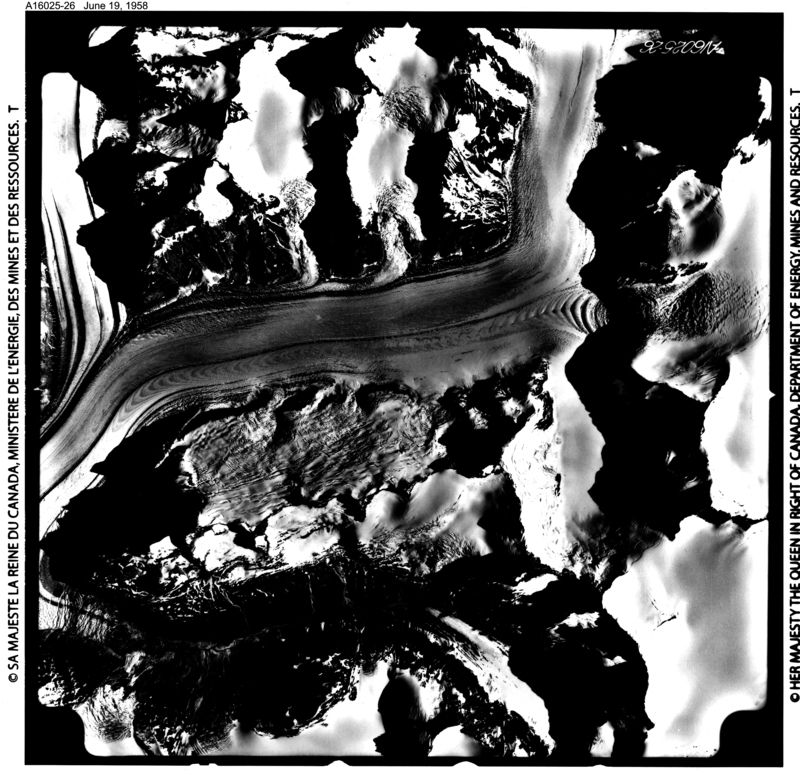 Aerial photography of the ogives from the 1950’s combined with current satellite image provide the opportunity to assess ogive wavelength over a 50 year period, providing a long term velocity record for Gilkey Glacier. An ogive is a bulge-wave that forms annually due to a seasonal acceleration of the glacier through an icefall. The acceleration is enhanced in icefalls that are horizontally restricted. In most cases we do not have specific measurements of velocity through all season to ascertain the timing of the accelerated period, though typically spring would be the fastest. After formation the bulges move down glacier and a new bulge is formed the following year. The resulting train of ogives extending down glacier can be used to estimate the ice velocity by measuring the peak to peak separation between adjacent waves. 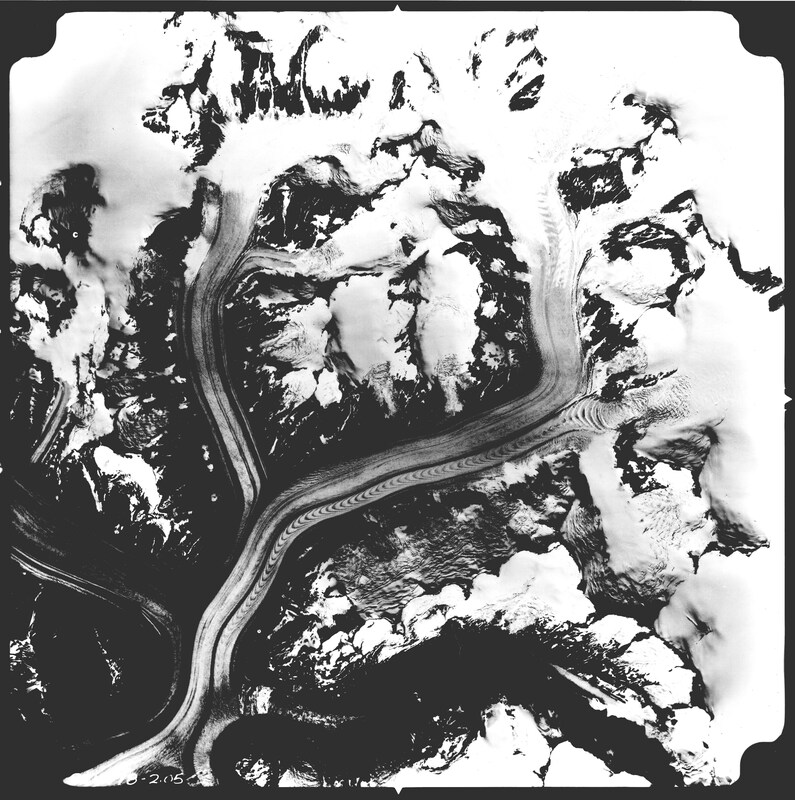 Ogives can be visually identified as a series of arcuate wave crests and troughs pointing down glacier. Downglacier from this formation point the crests and troughs gradually flatten until the ogives are merely arcuate light and dark bands on the surface of the glacier. The dark bands are dense, blue and dusty ice that is compressed during summer, whereas the light bands are bubbly, white, air-filled ice that is compressed during winter. In 1981 one of my tasks was to ski out through the top of the icefall inserting stakes in the crazily crevassed region to track summer velocity for the Juneau Icefield Research Program (JIRP). This has been completed often but not most years by JIRP. What we discovered was that velocity in 1981 had not changed from the 1960’s and 1970’s. Today we have frequent satellite imagery of the ogives to ascertain annual velocity that can be compared to the few aerial photographic records, in this case from 1056 and 1977. In several recent years Scott McGee of JIRP has specifically surveyed the distance between the first 11 ogive crest below the icefield. A comparison of the the ogives in 1956, 1977 and 2005 is possible by overlaying the images below. . The distance from the first to the 40th ogive has gone from 6.8 km in 1956 to 6.75 km in 1977 to 6.2 km in 2005. In 1956 and 1977 the first ten ogives spanned 1500 meters indicating an annual glacier velocity of 150 meters. From 2003-2007 the distance of the first ten ogives averaged 1440 m, or 144 meters per year. The change in velocity is quite small, compared to the large retreat of the glacier. One other key measure of the ogive surveying program is the surface elevation. A longitudinal profile containing 179 survey points was established at the base of the Icefall in 2001-2007. This profile begins in the trough immediately upglacier of the crest of the first wave ogive and continues downglacier nearly 1.8 kilometers to a point where the amplitude of the ogives becomes zero (Graphs and data from JIRP) During this six year time period, the surface has lowered an average of 17 meters – nearly 3 meters per year – along the longitudinal survey profile, with a maximum of 22 meters. This substantial thinning at the base of the icefall indicates reduced discharge through the icefall from the accumulation zone above. This will lead to further retreat and velocity reduction of Gilkey Glacier. 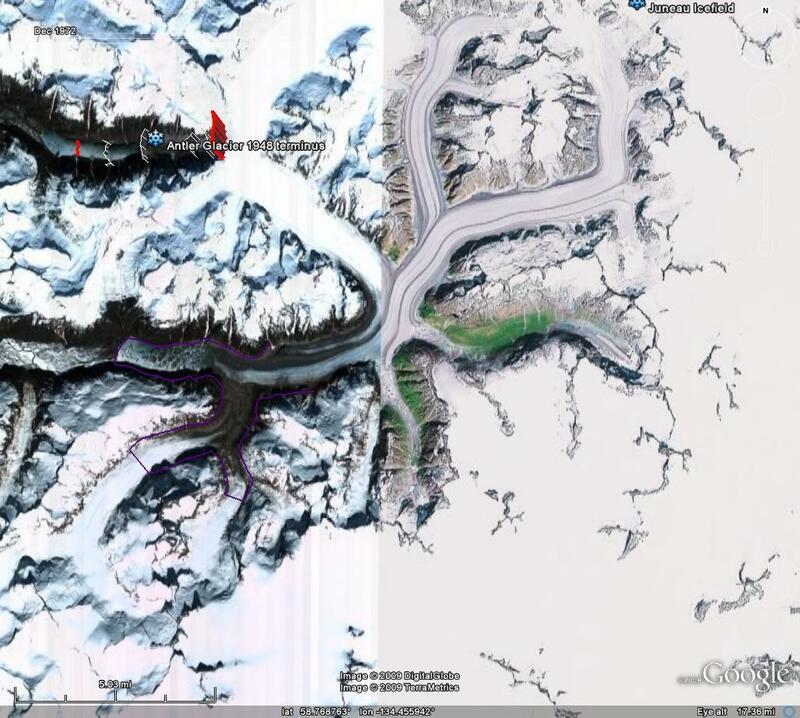 This entry was posted in Glacier Observations and tagged glacier ogives, Glacier retreat, juneau icefield research program, vaughan lewis icefall ogives. Bookmark the permalink.